How is YOUR Attitude? Are you a “Can-Do” or a “Can’t-Do” person? I believe Friday is in serious need of some #POSITIVITY! How is your attitude? Could it use a little adjusting? Do you need a little boost, an extra pep in your step? Today’s homework is to start a journal with 2 words written at the top, and then fill it in until you run out of ink… and then get a pen and keep writing! The magical words are: “I AM…” Simple. Declare unto you what YOU ARE. No negatives. No self-doubt. No sabotaging words. Practice kindness to yourself today. Here are a few words of encouragement from Jim Rohn about “can-do” people. 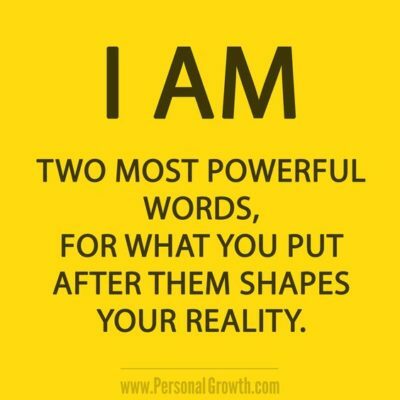 Once you start using the “I AM” in your vocabulary, you BECOME a “can-do” person! Can-do people are immune to burnout. They love what they do because they’ve learned how to fuel the fire that keeps them moving. The prize is not given to the person who’s the smartest, nor to the person with the advantages in resources and position, but to the person with passion. Can-do people can adjust to change. They don’t get caught griping about an unexpected curve in the road. They accept transition with an optimistic outlook. Can-do people are fearless. They go straight to the source of their solution. Their very effort commands attention as they wrestle a problem to the ground with expediency. They don’t wait; they initiate. Can-do people abstain from complaining. They recognize its futility and guard their minds and mouths against indulging in this time-wasting activity. Can-do people not only initiate, they finish. They are self-starters with the capacity to close the deal. 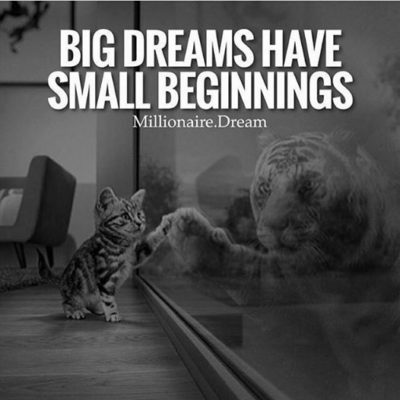 Big dreams have small beginnings. Roar Like a Lion! 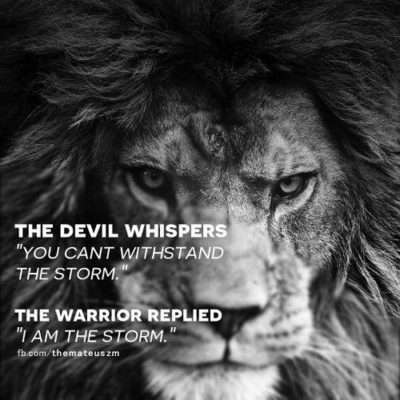 Be the Storm! So good! Do you ever feel like you are being “toyed” with? Like every time you make a right turn, a barrier is waiting for you? I had an interesting week with 3 down days with power outages and internet interruptions. Makes it difficult to create a masterpiece when sitting by candlelight with a pen in hand. But I DID IT! Life is flowing today, and MY GOD is bigger than any barrier sitting in front of me. Like the LION, I ROAR back before I take control of the moment. I had to get a little creative to get back lost time and resources, but I overcame by staying in the moment. Always remember, YOU are in control of how you act and how you REACT. Either you will spin it to a negative record, or you will put on some Garth Brooks and use your cowgirl boots to kick it out! Satan cannot touch the LION in the cowboy boots today! Just try me! 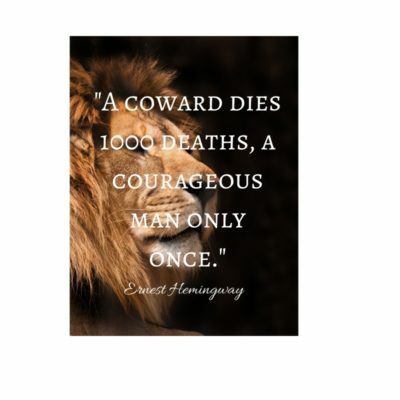 Which LION are you: Courageous or Cowardly? I was listening to Tony Robbins for morning motivation I heard this gem. What is your focus? What are you saying to yourself? Here’s an interesting analogy. If you saw a bad movie,would you continue to go back to that movie several times even though it made you miserable? Of course we wouldn’t… we wouldn’t waste our money and time on something we know we are not going to enjoy. So why do we agonize ourselves with sabotaging thoughts, causing an uneasy state? Like going to a bad movie over and over again, we have a choice on where to direct our focus and what movie we’re going to play in our heads every moment. Don’t create pain over and over again, feel the emotion once and let it go. Today’s wisdom… stay focused and do your best to stay in the present. If you find yourself fearful and worrying about the future remind yourself to come back to the now. We may not have control over what’s going to happen in two weeks, two months, or even two years, but we do have control over how we react right now. Choose your thoughts wisely, and if you find yourself getting fearful, instead go to a place of gratitude and kick those thoughts out of your head. Let Go and Let God… God Doesn’t Need Your Help Today! Let go, and let God. God doesn’t need your help today. This is where all of us should be. We need to ask HIM for what we want in our life and listen to that little voice within us. It is like “Faith the size of a Mustard Seed”. Have faith like that! Are you heeding the calling that you are meant to do? When you are doing what you are passionate about, you will know that it is your spiritual calling. Take a few minutes for this motivation and inspiration! and Sugar-Free recipes when you subscribe to the FREE HYB Newsletter. Heal Yourself Beautiful® created by Integrative Pharmacist Dr. Lori Arnold, Pharm.D., FAARM, Heal Yourself Beautiful® is the best resource for Integrative Medicine. Thank you for visiting HEAL YOURSELF BEAUTIFUL®. The entire contents of this website are based on the opinions and compilation of research and literature searches collected by Dr. Lori Arnold. The information is for informational and entertainment purposes only and is not a substitute for medical advice, diagnosis or treatment, and is not meant to replace a one-on-one relationship with a medical or holistic healthcare practitioner. The intent of this site is for the sharing of healthy information and Dr. Lori Arnold encourages each reader to make their own informed medical decisions in collaboration with qualified medical professionals. With that said, we hope that the information contained on this site is very helpful to you and will help you “Heal Yourself Beautiful®. Copyright © 2015 Heal Yourself Beautiful®. Click for your FREE copy of the Heal Yourself Beautiful® COOKBOOK!